Cap Creations: Shabby Apple Winner!!! 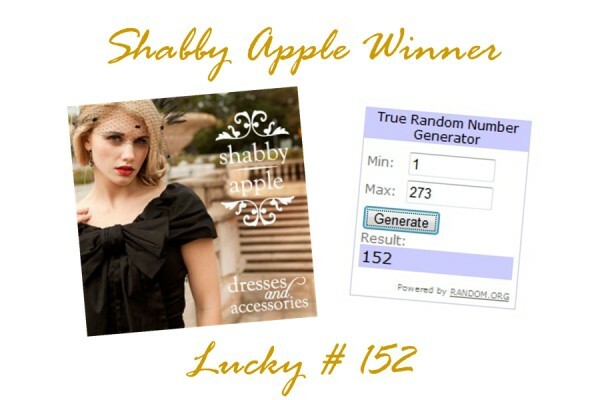 I have a winner for the Shabby Apple giveaway! Is the suspense killing you? I know several of you really wanted to win this one! And who wouldn't, their dresses are lovely. When Shabby Apple gave me the option of either reviewing a dress or doing a giveaway, I thought you, the Cap Creations readers would much love a giveaway!!! Comment #152 is Christy! Congrats Christy we will be in touch! Come back next week for a new giveaway everyone! I am so excited!!!! Yay!! !